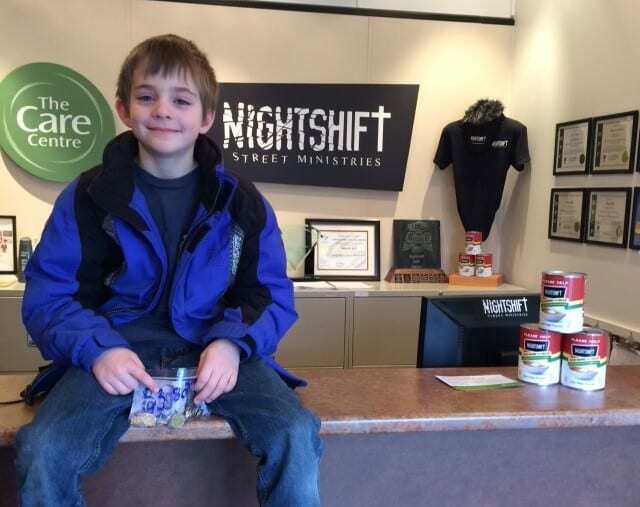 NightShift Street Ministries is a registered, not-for-profit society (#85203 8942 RR0001). We operate without government funding and rely instead on individual, church and corporate good will to provide our community services. We deeply appreciate all support and provide tax receipts for donations over $15. Choose a dollar amount from the buttons above to make an online donation through PayPal and hit “Donate Now”. Participate in our Matching Pledge Challenge – challenge us to match your pledge! Pick up a More Than Soup can to start saving those pennies. Or call the office on 604-953-1114 and ask to speak with William about other options, such as legacy planning. Isaac donated his birthday money. Spending of funds is confined to NightShift Board approved programs and projects. Each contribution directed toward an approved program or project will be used as restricted with the understanding that when the need for such a program or project has been met, or cannot be completed for any reason as determined by NightShift, the remaining restricted contributions will be used where most needed.